hehe i learnt a new song today. from Hillsongs Saviour King. Worship and praise Him, the Lord of lords.. This time round I have been watching many vcds and dvds on worship concerts. I observed the way the worship leaders lead the singing and worship. and ive learnt that, the way a person looks, the facial expression, body language, potrays very much what is going on in the inside parts. It reflects much on the heart of the worship leader. 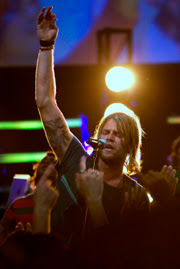 I remembered thinking "wow.. Joel Houston worships as if God was right in front of him. Darlene smiles at God and is just so relaxed and having a great time when she sings. Marty Sampson looks like he's singing a love song to his Father. Brooke Fraser's voice caused a breakthrough in my spirit." and i believe all this has happened, just because these people were having God right beside them and in them while they praised. They had to have a rock-solid relationship with the Holy Spirit to be able to cause such an upbuilding in the atmosphere. and influences you to praise. Also realized that however a person looks like when sh/he worships in church, most likely will reflect his worship with the door closed and the heart opened to God. I think that the depth of our worship and the closeness we have with God when we worship, together with to the degree our heart is open to God, this would naturally and definately reflect in our outward appearance. Inward adoration reflected in outward praise. Only what we have inside, will reflect outside. God, let us not forget the beauty of Your mercy and beauty of Your grace, and what You had done so that we could be Your people. We will not be ashamed of You.